Hermits originated on Cape Cod, Massacusetts, during the days of the Clipper Ships. They kept well for the sailors when stored in canisters aboard ship on long sea voyages - so they're perfect to pack in lunch boxes and also good for shipping. 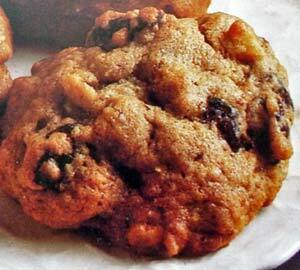 These cookies are loaded with raisins and nuts and have a simple soft and chewy texture. According to the calendar from the American Food Holidays, November 15th is National Spicy Hermit Cookie Day! A Washburn Crosby cookbook from the late 1800s noted in a recipe for Hermits cookies that the raisins, a traditional ingredient, must be "stoned and chopped." You'll find that Hermits are popular in both the United States and Canada with the main difference in recipe being that the Canadian version will usually include dates along with the raisins and nuts. They are quick to make and can be decorated with a sugar glaze or left plain - both versions are delicious. In a mixing bowl, combine brown sugar, butter, shortening, coffee, egg, cinnamon and nutmeg. Drop cookie dough by rounded teaspoonfuls about 2 inches apart onto ungreased cookie sheets. Bake about 8 to 10 minutes, until almost no indentation remains when touched. This recipe yields about 4 dozen Easy Hermits Cookies. 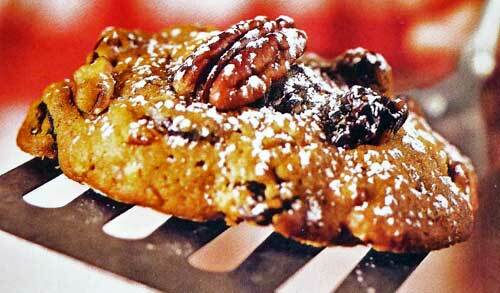 Your guests will enjoy this special treat of spiced pecan and raisin-filled cookies - a traditional Southern favorite! In a large mixing bowl, beat butter with an electric mixer on medium speed for 30 seconds. Add brown sugar, cinnamon, baking soda, cloves and nutmeg and beat until combined, scraping sides of bowl occasionally. Beat in egg and coffee until combined. Bake about 8 to 10 minutes, or until edges are light brown. Remove cookies from sheets and transfer to wire racks to cool completely. This recipe yields about 48 Hermits Cookies. These spicy drop cookies which are filled with raisins, figs and walnuts - and date back to Colonial times - are made irresistible with creamy vanilla frosting. In a medium bowl, stir together flour, baking soda, cinnamon, nutmeg, cloves and salt. In a large mixing bowl, beat shortening and brown sugar with electric mixer on medium speed until light and fluffy. Beat in molasses, eggs and sour cream until well mixed. Gradually beat in dry flour mixture on low speed just until combined. Stir in raisins, figs and walnuts. Bake about 13 to 15 minutes, or until golden. Beat butter and confectioners' sugar in a medium bowl until combined. Add the vanilla. Beat in milk, one tablespoon at a time, until frosting is smooth and spreadable. Let cookies stand until frosting is set. This recipe yields about 7 dozen Vanilla Frosted Hermits.